Right now I'm asking myself, "how did I miss this guy?" There are some folks in magic history that I've heard about all my life but don't really know much about. Today I'd like to share with you a little about the life of Nathan Leipziger, known professionally as Nate Leipzig. Nate was born in Stockholm Sweden in May 31, 1873. He came to America in 1883, so he missed the 1880 census and sadly the 1890 does not exist, it was destroyed years ago in a fire. But he shows up on the 1900 US Census. The reason I bring up the census records is because they add some interesting information that is different from what Nate wrote in his autobiography. Nate states his father was from Russia and his mother from Utica NY. However, the census records state his parents were both from Poland. And in 1900 he was 27, and still living at home and working as an 'optician'. It is possible his mother was born in Poland, moved to the US and that is where is father met his mother. Also, depending upon the area of Poland his father was from, it could have been considered Russia at some point. But then again, perhaps he was doing what many people did at that time and rewrote his own history. He apparently felt that if he read about a trick in a book, it was his duty to recreate the effect using his own methods. It was this unusual philosophy that caused him to not only impress magicians but everyone who watched him perform. Magicians were taking notice of the youngster. The King of Koins, T. Nelson Downs was bragging about a coin flourish that Leipzig had created. Ten Ichi from Japan was so impressed with Nate that he asked to meet with him and offered to trade the method of his Thumb Tie Routine for Nate's Ring on Stick routine. In 1901 Nate was asked to become a partner in an act by Berol and Berol which was a 'Rag Painting Act'. This alone is fascinating to me as I have never heard of rag painting. From what I gather, different colored rags were placed against a black velvet background to create recognizable works of art. Joining this act would mean Nate would have to leave home for the first time. His family did not have high hopes for his future with this venture. But as unique and novel as the act sounds, after two years the partnership split up and Nate was on his own. Here is when a stroke of luck comes his way. 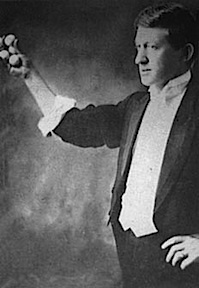 J. Warren Keane was a vaudeville magician who needed to find a quick replacement for his act. He called Nate, who had never done magic in vaudeville before, but Nate agreed to give it a try and began to perform at Proctors in NY. It turns out he was a huge hit. The same reason that magicians were bowled over by Nate was the same reason audiences were. He did tricks that no one had ever seen before and if they had, he did them differently than everyone else. In other words he was highly original. After appearing at Proctors for only two days, he received word that none other that William Morris wanted to see him. Nate showed up at his office and Morris offered Nate a contract to tour the Keith Circuit. Consider this, you don't find a bigger agent than William Morris, and Nate was brand new in the Vaudeville world, yet he had the bravery to haggle over the pay. Nate requested more than Morris was offering. They argued over it and Morris agreed to increase his pay. He knew Nate was worth it. His act consisted of manipulations with thimbles, billiard balls, cards and card tricks like the Rising Cards. He also presented Vest Turning, Ring of Stick and the Magnetized Knife. By 1904, Nate decided to change his name from Nate Leipziger to the shortened version that we all know, Lepizig. In 1906 offered a tour of Europe and he became as big a sensation over there with audiences as he had been in the U.S.. The one difference between Nate's work overseas is that he often had the opportunity to perform before royalty. He returned to the states for a few months but in 1908 he was heading back to England for more work. It was on this tour that he met Leila, who would become his wife. Over the next few years he would continue to travel the globe and return to the U.S.. But when WW1 broke out Nate had an interesting predicament. Because of his German sounding name, he was forced on occasion to alter it. One of the alterations was 'Nat Lincoln'. Over time, Nate began to slow his performing schedule down. He seemed to have a keen sense that Vaudeville was coming to an end and he switched gears to more private functions. He remained one of the most influential and original magicians of all time. He also picked up three students that he taught and shared his magic with. Those students were Roy Benson, Fred Keating and John Scarne. And of course his magic also greatly influenced Dai Vernon who wrote the book along with Lewis Ganson, 'Dai Vernon's Tribute to Nate Leipzig'. One of the lessons he imparted to his students was 'to never make a sucker out of a spectator'. In other words he was against embarrassing or humiliating a volunteer. Nate also believed in a natural approach to magic, he was against the fancy flourishes and finger flinging. He wanted things to be as simple and mystifying as possible. His one exception to the rule was the flourish that he had developed, and that most everyone in magic eventually learns but probably doesn't know who created it, the coin roll. 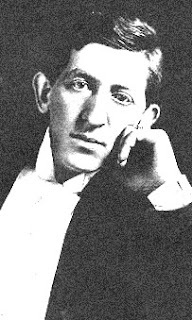 Nate Leipzig died on October 13, 1939 from cancer. He had a long and influential career in magic and his insight and magic live on today in the acts of many performers. When I started writing this I said "How did I miss this guy?". I don't have an answer. I knew who Nate Leipzig was, and have even read about him, but apparently it didn't sink it. When I was researching the life of Long Tack Sam I came upon a whole section in the wonderful Roy Benson book by Levent, about Nate Leipzig. As I read the words that Benson had to say about Nate, I sat spellbound. I began to recall moments in time when I heard others mention Leipzig, for example John Carney presents his version of a Leipzig Cigar Trick on one of his SECRETS DVDs. David Blaine actually has a Nate Leipzig trick that he apparently saves for special occasions to show clients because it's so strong. Well, as all this began sinking I decided to dig in and really look up this guy and it was like finding a whole new world! Thanks to AskAlexander.com, The Roy Benson by Starlight Book by Levent and Todd Karr, and other sources I learned a great deal about one of magic's greats and now can proudly say that I too have been influenced by the magic of Nate Leipzig. "David Blaine actually has a Nate Leipzig trick that he apparently saves for special occasions to show clients because it's so strong." Felix Berol (the magician he worked with) is my great great great uncle.